The Popstar Royalty, Sarah Geronimo will invade the land where life is on March 3, 8PM for THE GREAT UNKNOWN Unplugged live concert at SMX Convention Center, SM Lanang Premier, Davao City. 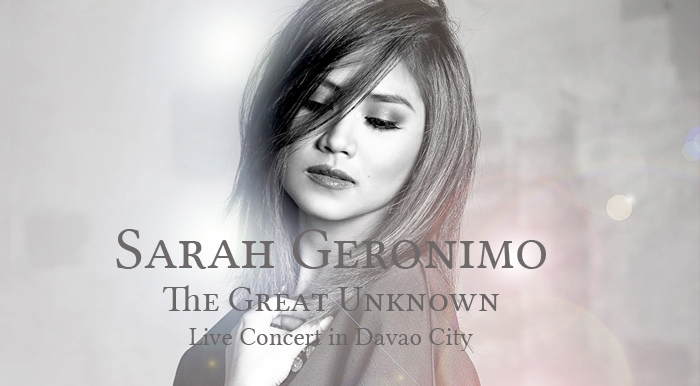 Davao Popsters and yours truly are all excited to experience the ultimate reveal of THE GREAT UNKNOWN. It’s not everyday Sarah Geronimo occupy Davao so I won’t miss this concert for the world. Sarah Geronimo is a Filipino singer, record producer, songwriter, dancer, actress and television personality. She's also widely known as the Popstar Royalty of the Philippines. Her contributions to the local music, film and television scene of the country has made her one of the famous figures of popular culture in the Philippines. BUY YOUR TICKETS AT SM LANANG PREMIER MALL GROUND FLOOR BELOW THE ESCALATOR BESIDE MARKS & SPENCER and SM Tickets Online. FOR INQUIRIES, YOU MAY ALSO CALL EKG PRODUCTIONS AT 09167495883. FOR INQUIRIES, YOU MAY ALSO CALL EKG PRODUCTIONS AT 09167495883. FOR SPONSORSHIP, please email to: ekg.productions@yahoo.com. 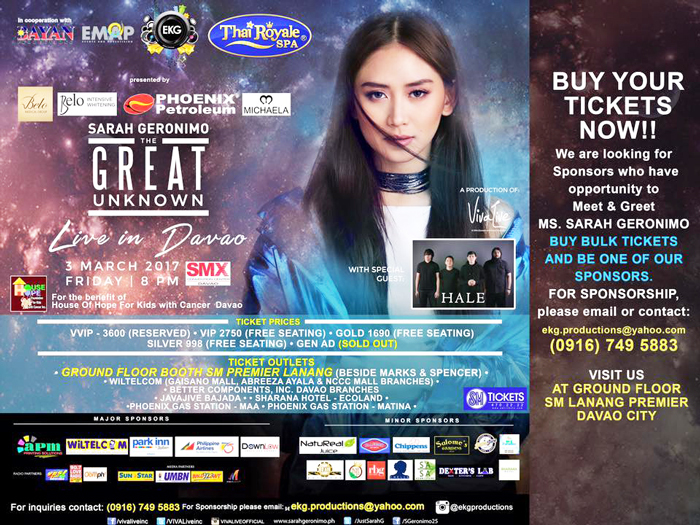 NOTE: Sarah G. The Great Unknown Unplugged LIVE IN DAVAO is the replacement of the postponed Sarah G. From The Top (SGFTT) last June 2016. Hence, you can use your SGFTT tickets here without additional cost. DID YOU KNOW YOU CAN WIN FREE TICKETS TO THE CONCERT? (must be public so it can be checked and verified). 6. Last day of sharing will be on March 2, 2017; 12:00 NN. Entries submitted after the cutoff will not be considered. 5 Winners will be picked through random.org and will win a Gold Ticket to the Sarah G Live in Davao concert. See here what Sarah Geronimo have to say!